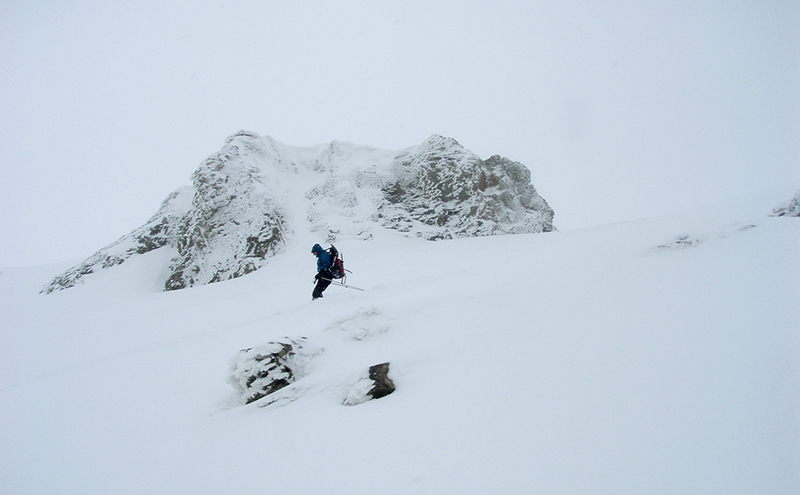 The first real powder turns of the season under Giosos Pass, on the freshly arrived Thick White Blanket. By the last posting in late January we left the mountain with the hope that this winter will be another “heavy” one in terms of snowcover and winter activities. But climatic patterns along northern Hemisphere had a different opinion, as intensified anticyclonic circulation over southern Europe blocked any activity related to precipitation. Mediterranean was no exception and even worse, successive episodes over north Africa transported warm Saharan air and dust as north as Romanian mountains. In early March things changed (due to a change of atmospheric circulation over the Arctic) and blocking conditions ceased. The results heavy dump of snow and intense rain over most of southern Balkans. The season rebooted. The long desired Thick White Blanket spread all over the Gods alley. Even though snowfall started with high temperatures and there is generally good bonding in the fresh snow, weak layers (Sahara dust laden frozen snow) are present above 2300m, so avalanche danger is still high. Best wishes for a late ski season! Approached either from Litochoro (Livadaki trail) or from the most popular Military Camp, the southern part of Mount Olympus, now loaded with fresh snow comprises the Mecca of ski touring.